The LNG industry is going through a dramatic transformation. 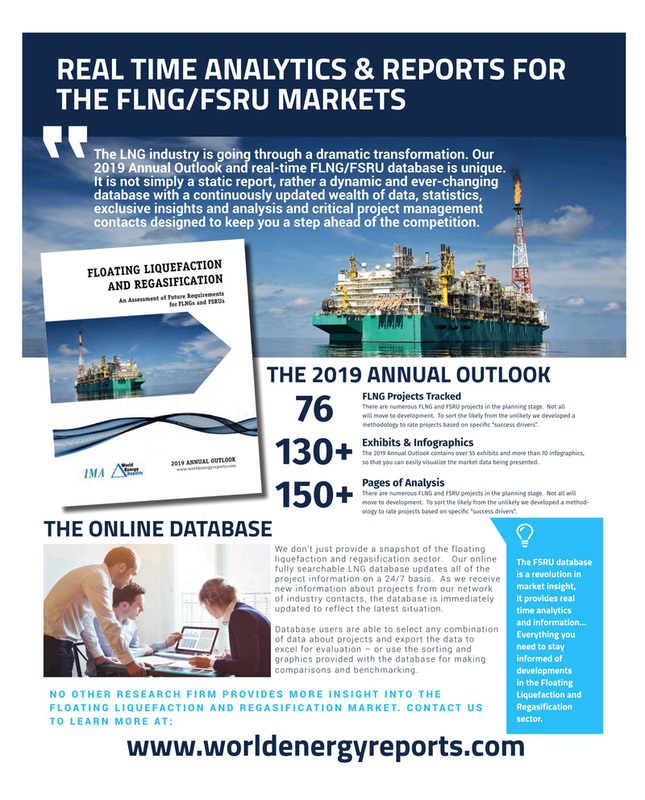 Our 2019 Annual Outlook and real-time FLNG/FSRU database is unique. It is not simply a static report, rather a dynamic and ever-changing database with a continuously updated wealth of data, statistics, exclusive insights and analysis and critical project management contacts designed to keep you a step ahead of the competition. There are numerous FLNG and FSRU projects in the planning stage. Not all will move to development. To sort the likely from the unlikely we developed a 76 methodology to rate projects based on specifc “success drivers”. There are numerous FLNG and FSRU projects in the planning stage. Not all will move to development. To sort the likely from the unlikely we developed a method- 150+ ology to rate projects based on specifc “success drivers”. Everything you of data about projects and export the data to need to stay excel for evaluation – or use the sorting and informed of graphics provided with the database for making comparisons and benchmarking.